Integral Life and ecologist Sean Esbjorn-Hargens have published a new introduction to philosopher Ken Wilber’s AQAL Integral Theory. This new introduction purports to be an ‘up to date’ summary of Wilber’s theory – and is oriented towards helping people approaching integral theory for the first time. The world has never been so complex as it is right now—it is mind boggling and at times emotionally overwhelming. Not to mention, the world only seems to get more complex and cacophonous as we confront the major problems of our day: extreme religious fundamentalism, environmental degradation, failing education systems, existential alienation, and volatile financial markets. Never have there been so many disciplines and worldviews to consider and consult in addressing these issues: a cornucopia of perspectives. But without a way of linking, leveraging, correlating, and aligning these perspectives, their contribution to the problems we face are largely lost or compromised. We are now part of a global community and we need a framework—global in vision yet also anchored in the minutiae of our daily lives—that can hold the variety of valid perspectives that have something to offer our individual efforts and collective solution building. In 1977 American philosopher Ken Wilber published his first book, The Spectrum of Consciousness. 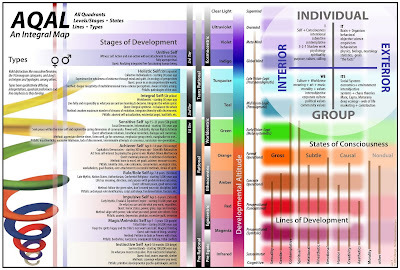 This groundbreaking book integrated the major schools of psychology along a continuum of increasing complexity, with different schools focused on various levels within that spectrum. Over the next 30 years he continued with this integrative impulse, writing books in areas such as cultural anthropology, philosophy, sociology of religion, physics, healthcare, environmental studies, science and religion, and postmodernism. To date, Wilber has published over two dozen books and in the process has created integral theory. Wilber’s books have been translated into more than 24 languages, which gives you an idea as to the global reach and utility of integral theory. Since its inception by Wilber, integral theory has become one of the foremost approaches within the larger fields of integral studies and meta-theory. This prominent role is in large part the result of the wide range of applications that integral theory has proven itself efficaious in as well as the work of many scholar-practitioners who have and are contributing to the further development of integral theory. Integral theory weaves together the significant insights from all the major human disciplines of knowledge, including the natural and social sciences as well as the arts and humanities. As a result of its comprehensive nature, integral theory is being used in over 35 distinct academic and professional fields such as art, healthcare, organizational management, ecology, congregational ministry, economics, psychotherapy, law, and feminism. In addition, integral theory has been used to develop an approach to personal transformation and integration called Integral Life Practice (ILP). The ILP framework allows individuals to systematically explore and develop multiple aspects of themselves such as their physical body, emotional intelligence, cognitive awareness, interpersonal relationships, and spiritual wisdom. Because integral theory systematically includes more of reality and interrelates it more thoroughly than any other current approach to assessment and solution building, it has the potential to be more successful in dealing with the complex problems we face in the 21st century.